Here is another set featuring everyones favourite extraterrestrial. I hope you enjoy using them as much as I enjoyed creating them. To download the Zip file containing all of these graphics click here. I only ask for one thing in return, a link back to Lunar Graphics somewhere on your site. Click on the background to view it in its full size and then save it. 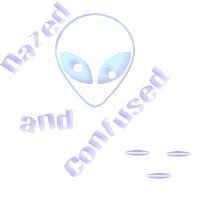 *Confused Alien graphics created by Sandra Laurens, president Lunar Graphics.